The UN Declaration on the Rights of Indigenous Peoples makes it clear that indigenous peoples have the right to practice, manifest, protect and develop their own cultural, social, religious and educational development. Art. 23 specifically states that “IPs have the right to determine and develop priorities and strategies for exercising their right to development.” The territorial framework for the operationalisation of the Declarations may be the community, the region or the state depending on demographic facts, political traditions, etc, and aspirations of the peoples. Keeping in mind article 4 of the Declaration that “indigenous peoples have the right to autonomy or self-government in matters relating to their internal and local affairs”, the Expert Meeting focused on the relationships between types of autonomy and the opportunity for indigenous peoples in a sustainable way to develop health, housing, and other economic and social programmes. In the 2030 Agenda, Goal 1 recognizes that ending poverty in all its forms everywhere is the greatest global challenge facing the world today and an indispensable requirement for sustainable development. The Division for Social Policy and Development (DSPD) of the United Nations Department of Economic and Social Affairs, in collaboration with the Social Development Policy Division of the Economic Commission for Africa (ECA), is organizing an Inter-Agency Expert Group Meeting on the “Third United Nations Decade for the Eradication of Poverty” under the theme “Accelerating global actions for a world without poverty”. The meeting will be held in Addis Ababa, Ethiopia from 18 – 20 April 2018, as part of the preparations for the seventy-third session of the United Nations General Assembly. The Division for Social Policy and Development (DSPD) of the Department of Economic and Social affairs (UNDESA) is organizing an Expert Group Meeting on “Family policies for inclusive societies”, 15-16 May 2018 at UN Headquarters in New York. The meeting aims to analyse the importance of family policies for the achievement of SDG 16 – promoting peaceful and inclusive societies for sustainable development, and SDG11 – making cities and human settlements inclusive, safe, resilient and sustainable. Several targets under SDGs 16 & 11 will be analysed by experts representing major regions. Inter-regional workshop on “Revisiting socio-economic policies to address poverty in all its dimensions in middle income countries” organized by DSPD/DESA, in collaboration with ESCWA and ECLAC. The workshop aims to examine national experiences in developing coherent and integrated socio-economic policy frameworks to address poverty in its multiple dimensions, within the context of the 2030 Agenda for sustainable development, and identify common challenges, good practices and lessons learned with an aim to improve evidence-based policy-making. Discussions will also address capacity and institutional gaps facing countries in the reform and implementation of poverty reduction policies. The workshop will contribute to enhance the knowledge of participants and help DESA, ESCWA and ECLAC to identify a set of recommendations to develop a framework to support countries at policy and analysis level to address poverty in all its dimensions. The Division for Inclusive Social Development (DISD) of the United Nations Department of Economic and Social Affairs (UN DESA), is organizing an expert group meeting and inter-agency dialogue on “Strengthening the Global Framework for Leveraging Sport for Development and Peace”. The meeting will be held in New York, USA from 13 – 14 June 2018, as part of the preparations for the 73rd session of the United Nations General Assembly. The meeting will be a two-day, two-part event that will allow for exchange of ideas among representatives from the United Nations system, independent experts, rele-vant regional and international organizations, and other stakeholders. The meeting is expected to provide substantive input for the preparation of the re-port of the Secretary-General on “Sport for Development and Peace” to be sub-mitted to the 73rd session of the General Assembly. The expert group meeting is convened in the context of this resolution and in preparation for the fifth-seventh session of the Commission to be held in February 2019, which will produce a negotiated policy outcome (a resolution) on the priority theme. The Commission for Social Development continues to prioritize and give prominence to the review and follow-up of the Copenhagen World Summit for Social Development. Furthermore, the Commission will make a vital contribution to the follow-up of the 2030 Agenda for Sustainable Development by supporting the thematic reviews of the high-level political forum on sustainable development (HLPF) on progress on the implementation of the Sustainable Development Goals, including cross-cutting issues. The outcomes of the meeting will contribute to the work of the Commission by providing concrete, evidence-based policy recommendations on strategies for addressing inequalities and challenges to social inclusion. 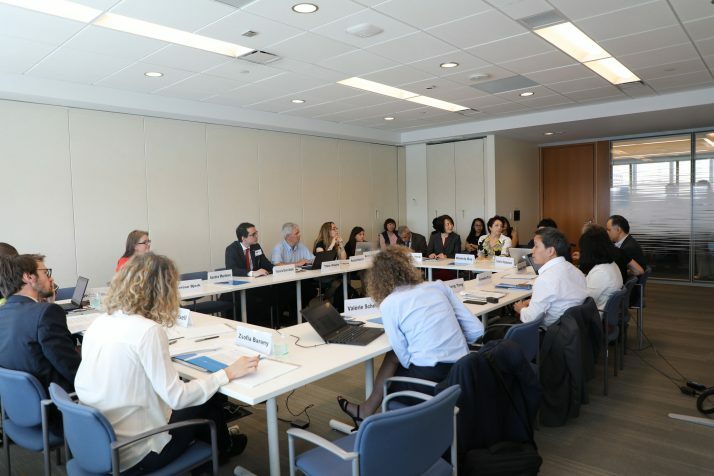 In particular, the meeting is expected to provide guidance and key input for the preparation of the Report of the Secretary-General on the priority theme. This expert meeting will serve to gather inputs from experts on inequality and its impacts to prepare for the 2019 Report on the World Social Situation. Experts will present recent research on economic and other types of inequality as well as on their social and political costs. They will also make policy recommendations. The last session of the meeting will be devoted to discussing the outline of the Report. The Division for Inclusive Social Development (DISD) will prepare a short report of the outcomes of the meeting, based on substantive presentations by invited experts and interactive discussions. The meeting will allow a robust exchange of ideas and lessons learned. The narrative that globalization and technological change have been the central forces hollowing out the jobs market, squeezing ‘the middle’, driving up inequality, and undermining growth is frequently taken to apply across the rich countries. Brian Nolan’s presentation summarizes his recent work, including a set of country case studies of the US alongside other rich countries, that highlights just how varied their experiences since the 1980s have actually been. Country contexts really matter, and policy responses must be framed in light of the institutional point of departure and distinctive challenges each country faces. Presentation by Professor Brian Nolan, Director of INET’s Employment, Equity and Growth Programme, University of Oxford – for full bio see here. This Expert Group Meeting will bring together experts and representatives from academia, United Nations entities, and intergovernmental organizations as well as young social entrepreneurs, to discuss the following overarching questions: How do young social entrepreneurs support socio-economic advancement, help vulnerable groups access opportunities and ultimately contribute to system change? What is needed for youth social entrepreneurship to be an effective tool towards the 2030 Agenda? How can governments put in place enabling ecosystems for youth social entrepreneurship to significantly help advance the 2030 Agenda? The results of this meeting will support the preparation of the 2019 World Youth Report on the same theme. The Division for Inclusive Social Development (DISD) of the UN Department of Economic and Social Affairs (UN DESA) is partnering with the Doha International Family Institute (DIFI) in organizing an Expert Group Meeting on the Role of Families and Family Policy in Supporting Youth Transitions, to take place in Doha, 11-12 December 2018. The expert meeting aims to explore how family policies can contribute to helping youth in their transitions from education to employment and family formation. The needs of vulnerable youth should be addressed through holistic family oriented policies. Experts will present research and recommendations on how public policy can best support the achievement of youth related Sustainable Development Goals and targets and thus contribute to the implementation of the 2030 Development Agenda.